Searching for happiness seems to be one of the most important things in people’s lives today. Here in India, we’ve got the ‘Art of Happiness’ program, in Bhutan they’ve got their gross national happiness, and if you look online there’s websites called Berkeley’s Happiness Program or Regaining your happiness in seven weeks – that seems a long time to achieve a little bit of happiness – and there’s the Way to Happiness Foundation, which has 21 precepts which can lead you to happiness. There are also apps that help boost your happiness, such as Happy Now, Happy Habits and Happify. All these things are telling us that we have to be happy. But they’re also trying to say to you that happiness is a destination and it isn’t. Happiness is an emotion. It’s just a small part of our lives. There’s also sadness, positivity, negativity, pride, jealousy, anger, contentment, gratitude and so on. All of these are just parts of our life. None of them are a destination. None of them are somewhere we should head to. It doesn’t matter if you take 21 precepts to lead you there or study for seven weeks, you simply will never reach total happiness. Life is not and cannot be just about happiness. Let’s be honest, you’ll never reach happiness in seven weeks, because as soon as you collect your happiness certificate somebody will come along and do something or say something or something bad happens to you and instantly your happiness has disappeared. 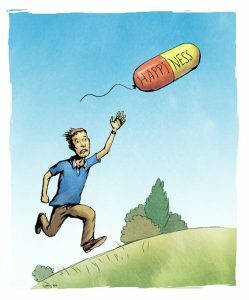 So, happiness is not a destination and not something we should aim for. So, what should we be aiming for? I believe we should set our sights on peace of mind. That should be our destination. That’s the direction we should be going in because when our mind is calm, peaceful, still and silent, it doesn’t matter if you’re happy, it doesn’t matter if you’re sad, you just deal with whatever life is throwing at you. You won’t get attached to the happiness and you won’t try to push away the sadness. You’ll just go through the happiness, go through the sadness, go through the negativity, go through the positivity. I honestly believe a peaceful mind is what we should be aiming for. This is where meditation helps. We sit down and calm our minds by focusing on one thing. When we focus on one thing, it makes us tranquil and calm. Our body relaxes, our breathing becomes more balanced and our mind begins to open. We become more peaceful. A peaceful mind is important because our senses are bombarded the whole time. There’s always noise, smells, things to see, taste, touch. Everything is going on around us and our mind can’t concentrate because it’s being pulled in so many directions. So, in meditation we’re trying to teach the mind to focus on one thing and stay focused on it. What you learn on the meditation cushion can be taken out into your daily life. Remaining focused on a single thing is a wonderful skill that helps relieve pressure on our minds. A good example of how we can put this skill to use is when we are reading a book. I mean truthfully, how many times have you been sitting reading a book and then halfway through your mind goes off, but you kept on going through the motions of reading. You keep reading it and you keep turning the pages over and yet your mind has wondered off. When you eventually realise you have lost your focus, your mind returns to the book and you have to go all the way back and start reading from the beginning. So, meditation teaches us how to stay focused and this leads to a peaceful mind. This mind is then able to deal with whatever life brings along. It may take longer than 7 weeks to achieve, but it is going to be worth it. Happiness is a short-lived thing, but peace of mind knows no limits. So, which one do you think we should be chasing?